Thomas Law, “Thomas Law,” Histories of the National Mall, accessed April 22, 2019, http://mallhistory.org/items/show/135. 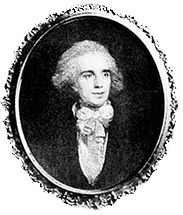 Thomas Law was a wealthy Englishman who invested financially and ideologically in the development of the new city of Washington. In 1804 he wrote a pamphlet, published anonymously, proposing a canal from the Anacostia River to the Potomac following Goose Creek, which he thought would encourage trade in the city. He was one of the incorporators of the Washington Canal Company. Papers of George Washington. View original image. Thomas Law was born in England to a prosperous family. His father was the Bishop of Carlisle and one of his brothers was made a Baron. When he was 17, he traveled to India to work as a clerk for the East India Company. He rose through the company and developed an interest in taxation and the ways in which it can be used to benefit both individuals and the government. He returned to England in 1791 due to health problems. In 1794, Law moved to the United States, partly due to his frustration over a dispute with the East India Company. He arrived in New York but quickly moved to Virginia. Two years after he arrived, he married Elizabeth Parke Custis, George Washington's step-granddaughter. The couple separated in 1804 and divorced in 1810. Law used much of the fortune he had made in India to buy land and houses in the new federal city of Washington. He advocated for the construction of a canal from the Anacostia River to the Potomac following Goose Creek, authoring a pamphlet in 1804 which argued that the canal would bring trade to the young city. The Englishman also supported the arts in Washington, helping establish the first theatre and a dancing society. He died in 1834, having outlived all but two of his children.